Royal Canin Obesity Management is a complete food for adult cats that are obese. It has been specially developed to help reduce body weight in cats that are very overweight. It has low energy density and low calorie levels to help with weight management. To avoid deficiencies, the food also contains plenty of nutrients, vitamins and minerals to ensure that your cat takes in the complete balance that she needs. A high protein content will ensure that muscle mass is maintained despite weight loss. Obese cats have high pressure on their joints and bones due to their large frames. The food will help to maintain strong and healthy bones and joints. Essential fatty acids will help your cat to have healthier skin and a shiny coat. Complete dietetic feed for adult cats. It is recommended that a veterinarian’s opinion be sought before use or before extending the period of use. 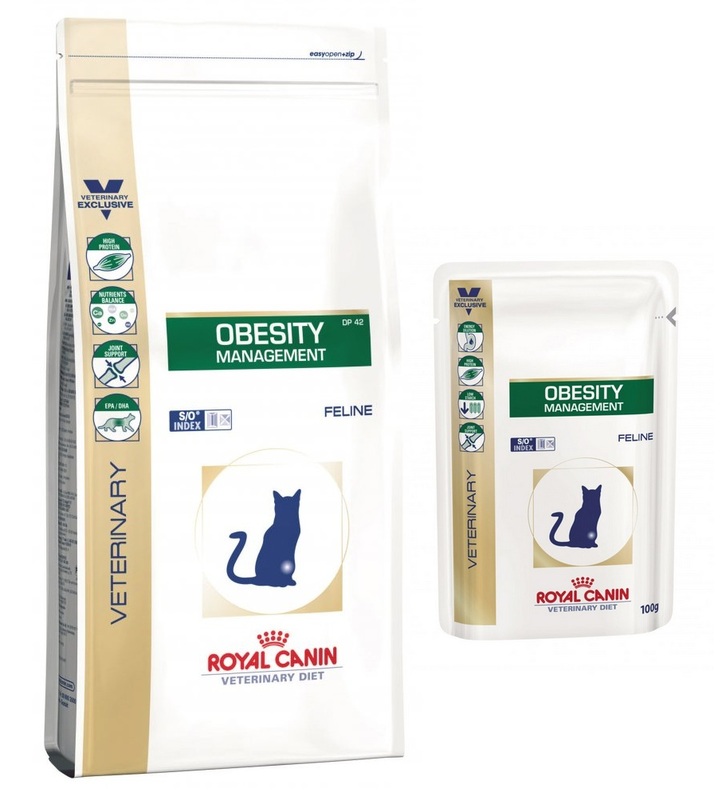 Feed Royal Canin Obesity Management until the target body weight is achieved. Dehydrated poultry protein, wheat, wheat gluten*, vegetable fibres, maize gluten, hydrolysed animal proteins, animal fats, beet pulp, minerals, fish oil, psyllium husks and seeds, hydrolysed crustaceans (source of glucosamine), marigold extract (source of lutein), hydrolysed cartilage (source of chondroitin). Vitamin A: 25000 IU, Vitamin D3: 1000 IU, E1 (Iron): 39 mg, E2 (Iodine): 3.9 mg, E4 (Copper): 3 mg, E5 (Manganese): 51 mg, E6 (Zinc): 152 mg, E8 (Selenium): 0.07 mg - Preservatives - Antioxidants. Vitamin D3: 190 IU, E1 (Iron): 6.4 mg, E2 (Iodine): 0.2 mg, E4 (Copper): 1.7 mg, E5 (Manganese): 2 mg, E6 (Zinc): 20 mg - Technological additives: Pentasodium triphosphate: 2 g, Calcium sulphate: 1.2 g.
There are currently no questions for Royal Canin Feline Veterinary Diets Obesity Management Cat Food - be the first to ask one!